You are well camouflaged there....we recognise that leg back pose. Waiting for my dad to get back to work! PERFECT POSE there BUDDY.... Showing them your BEST side and sayin TALK to the PAW .. What did they do??? You didn't get caught did you? BOL! Love that pose Duncan! Looks like your tryin' to use your mind to transport your Pops into his chair! You hit the nail on the head. 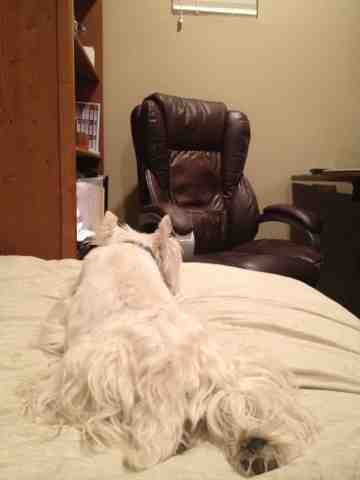 He was gone and I was missing him so I stared at his chair for a loooong time trying to wish him home. Didn't work, by the way. Nothing beats a good nap while waiting for the peeps to come home. Hey Duncan, the computer is free...go online and order yourself some toys and treats!! Duncan matches exactly with the blanket - Adorable!